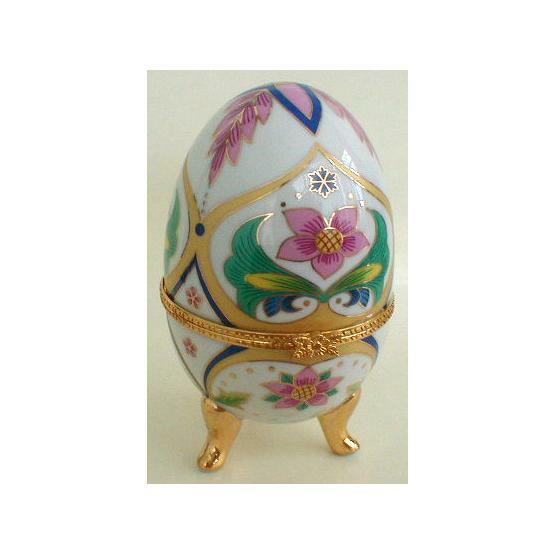 Authentic Russian porcelain egg before you is designed in a distinctive style of the world-famous Carl Faberge, Jeweler to the Russian Imperial Court. 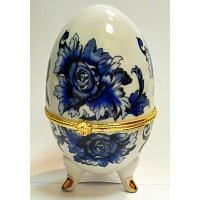 Each egg - being hand painted by a professional porcelain painter - stands regally on three legs. 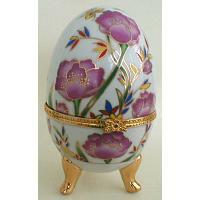 Each of the majestic eggs also has a hinged backing and is embraced by a rim finished with a miniature ribbon clasp. It may serve either as an elegant jewelry box or an exquisite table decoration. Pattern may vary but we always strive to match the original. Size: approximately 4x2.3" (10x6 cm). Imported from Moscow, Russia. Ships within 5 business days.